Software success is fleeting—for every program such as BBEdit that becomes a software staple, you can find countless applications that are all the rage for a year or two and then either stop working or fade in popularity. Longevity is especially rare for software that tweaks your Mac’s features and interface: Whenever Apple releases a major OS update, it renders some of that third-party software incompatible or irrelevant. In other words, it’s tough for system-enhancement software to stay both compatible and compelling. Over the past 20 years, I’ve installed countless such apps, and I can count on one hand the programs that have been around for most of that time. That's what makes St. Clair Software’s Default Folder X so impressive. It’s the rare piece of system-enhancement software that has survived multiple major versions of OS X while remaining functional, useful, and stable—in fact, it survived the transition from Mac OS 9 to OS X. I’ve been using it for almost as long as it has been around. 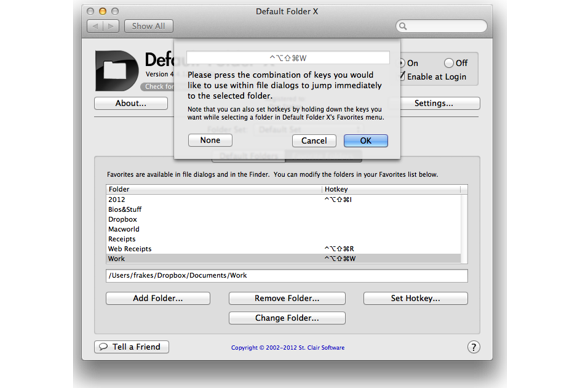 If you’ve never used Default Folder, it enhances OS X’s Open and Save dialog boxes to make them much more useful. 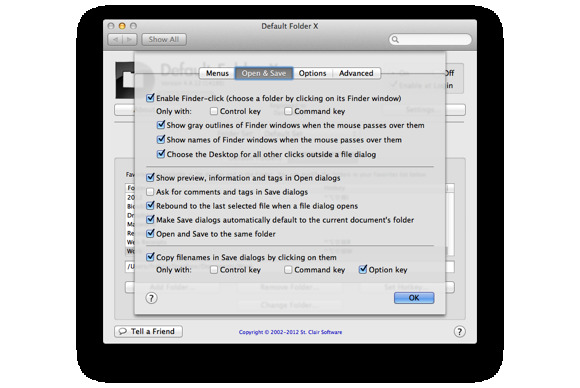 For starters, as its name implies, Default Folder lets you choose a default folder for each application, so whenever you access an Open or Save dialog box in a given app, your favorite folder for that app is already chosen; alternatively, you can have Default Folder automatically navigate to the most recently accessed folder or file in each program. This feature alone saves me countless clicks and hassles every day. Default Folder also places a bezel (or a toolbar—you can choose) around your Open and Save dialog boxes that contains useful menus and features. The main menu lets you view information about a file or folder from within the dialog box; you can also open a folder in the Finder without leaving the dialog box, rename files or folders, reveal items in the Finder, move items to the Trash, and even compress files and folders—again, all from within your Open and Save dialogs. Another menu lets you quickly access any mounted volume; the menu is hierarchical, allowing you to navigate to any folder within any volume, as well as to any folder on your Desktop or in your Home folder. The Favorites menu permits you to add frequently accessed folders and quickly navigate to them or to any folder within any of them—you can even assign keyboard shortcuts to favorites, and you can create multiple sets of favorites. The Recent menu lists recently accessed folders, and the Finder menu shows all windows currently open in the Finder. Related to that last item is perhaps my favorite Default Folder feature: While you're in an Open or Save dialog box, if you click any visible Finder window, Default Folder switches the file dialog’s location to that Finder window. Default Folder X is one of the first things I install on any of my Macs, and I honestly have a difficult time using a Mac without it. To someone who has never used it, OS X’s Open and Save dialog boxes likely seem sufficient; but once you’ve used Default Folder X for a while, OS X’s stock file-navigation dialogs feel crippled and half-baked. Amazingly, the initial version of Default Folder, called DFaultD, was written in 1987. According to Jon Gotow, the man behind St. Clair Software, he was using Macs running System 3 for research and writing. “Every time you went to open or save a file, it’d point you at the root level of the disk and you’d have to navigate down into your folder again. This drove us crazy,” Gotow told me. Partly to fix this, and partly to prove to an officemate that he could do it, Gotow whipped up a basic INIT (system extension) that would let the user set the default folder for Open and Save As dialog boxes. He later created a control panel to configure settings and released the utility—on the Info-Mac archives—as shareware. The initial version of DFaultD simply let you set the default folder for an application, but Gotow soon added folders for recently accessed and favorite items, as well as pop-up menus in file dialogs for accessing them. As time went by, users requested new features—and Gotow implemented many of them. The biggest challenge, of course, was updating Default Folder for Mac OS X, although Gotow says the initial versions of Default Folder for OS X, called Default Folder X, were easier to create than later versions, despite a new interface and a different feature set; he was even able to take advantage of some amount of Carbon code from Mac OS 9. Over time, however, Mac OS X changed significantly. For example, Apple rewrote the code underlying file dialog boxes and, of course, switched from PowerPC to Intel processors. St. Clair Software spent a lot of development resources just keeping the utility working. But OS X also drove new features, according to Gotow. For example, many people missed the classic Mac OS feature of putting folders and volumes in the Apple Menu to get hierarchical access to files, so St. Clair added systemwide menu-bar and Dock menus that provide similar functionality. Spotlight and OpenMeta tagging are also new with OS X. And in early versions of OS X, when Apple failed to provide reliable keyboard-navigation features in file dialogs, Default Folder offered the only way to restore the expected behavior. After its 25 years of consistent development, you’d think Default Folder X users would feel confident that the software is here to stay. But Apple’s recent focus on sandboxing for Mac App Store apps, and Gatekeeper in Mountain Lion, are raising valid concerns for system-enhancement utilities. For obvious reasons, Default Folder X can’t be sold through the Mac App Store, so it’s not (yet) subject to Apple’s sandboxing rules. It’s easy enough—for now, at least—for users to exempt Default Folder X from Mountain Lion’s Gatekeeper restrictions. People are concerned, though, that Apple will someday require that all apps adhere to the App Store’s sandboxing requirements, and such a restriction would effectively kill utilities such as Default Folder. Default Folder lets you configure keyboard shortcuts for specific folders. That evolve-and-adapt strategy is a big reason why the software has survived for 25 years—and why I still rely on it.